Recently there were some green clouds over Moscow. News reports speak of heavy pollen in clouds. If pollen, why has the phenomenon apparently not shown up before? Any explanation as to what this is? http://www.youtube.com/watch?v=sJNvFnR8jrw [and from another] http://rt.com/news/green-clouds-moscow-aliens-050/ Mysterious green clouds have been spotted over the Russian capital, sparking fears of a chemical disaster and even some doomsday theories. But the Emergencies Ministry is advising the public to calm down. It says the clouds are actually composed of birch pollen, not of chemicals from an allegedly burning factory in the Moscow region. The odd natural phenomenon mystically coincided with the 26th anniversary of the Chernobyl disaster, which caused further speculation. The Earth wobble has produced a wildly swinging climate for many regions of the world, with all manner of reactions in the fauna and flora. Sea creatures have been found too far north or south, floating algae in the Arctic, and migrating birds coming and going as though the seasons were uncertain for them. Crop failure in fruiting trees has resulted due to early blooming with sudden devastating frosts, and certainty about the right time to pollinate confused. Spring is normally a steady stage, spread over several weeks of gradually warming temps. Not all plants in a genus bloom and pollinate simultaneously, as there are genetic differences, but when the surging temps signal all the plants all at once, large pollen clouds could result. Similar reactions in the animal kingdom have resulted, where spiders have spun mass webs in trees in reaction to flooding or multiple births are reported in wildlife whose bodies have been signaled that a catastrophe is coming and survival of the species might be threatened. The pollen clouds are not the most interesting feature of this story. It is the reaction of the populace - that an apocalypse had occurred. Indonesia and Malaysia have lived up to their reputations of being dictatorial and insensitive to their people during the 7 of 10 sinking of the Sunda Plate. It was not just a grip on their local media that prevented honest discussion of the inundation from the sea, but was also cooperation from the larger media networks around the world. It was blamed on rain, even when the flood water refused to drain and were clearly from salt water. It was the mining companies, making the ground unstable. It was erosion of the soil, broken sea walls, and poor government planning for drainage ditches. Anything but the truth. The flooding of Bangkok is the only instance that got media coverage, and this only because it was a popular tourist destination. Left with this, what is a citizen to do? The compensation for a lost home or farm is meager, assistance in relocating almost nonexistent. Any attempts by investigative reporters to report the situation in accordance with the facts is met with brutality. The truth is discovered on the Internet and shared in whispers with friends and neighbors. And the burning anger that comes from realizing your government knew this was all coming and said nothing can only cause ulcers. The citizens must watch their leadership strut around in pomp and ceremony, and can do nothing. Rioting, where their emotions overwhelm fear, is the only outlet. With almost no historical records and relying upon computer models to support their new theories, once again the establishment has sent scientists forth to proclaim they know the reason for the drought/deluge cycles we predicted so accurately in 1995. Of course salinity has decreased in some areas, because glaciers and polar ice have been rapidly melting – another one of our accurate predictions. The salinity of the oceans is less than 1% responsible for the drought/deluge cycle, and this is an entirely made up rationale. It is the wobble, the Earth wobble we also predicted would become increasingly apparent as it became more violent. As with so many of the establishment’s desperate attempts to explain the Earth changes caused by Planet X, this one again points to a symptom as the cause. What changed the salinity? If they point to the melting poles, what caused the poles to melt? If they point to warmer water sloshing the polar ice from beneath, what caused the warm water to arrive at the poles? In 1995 we predicted increased drought and deluge, not only the intensity, the grip, but occurring in unexpected places opposite of what is expected. This then is precisely what occurred. Where we did not explain the pending Earth wobble in 1995, we knew the effect that was to come. It is the wobble which is causing the drought and deluge problems. Is the public likely to buy into such sketchy explanations, supported not at all by historical records and based, once again (as was the Global Warming theory) on computer models designed to support the theory? The public has gotten increasingly skeptical of official explanations for the moaning and singing and booming Earth, the increase in earthquakes, the wandering compass, the fireballs in the skies, the Sun and Moon out of place, and the highly erratic weather out of keeping with what is expected of the seasons. They hear Internet reports of objects near the Sun, reports which explain the Earth changes where the media shies away from the evidence. The establishment has lost the public, a fact which has not yet sunk into the self-absorbed brains in the think tanks of the cover-up. The public will look askance upon the salinity theory, built upon the ashes of the Global Warming theory like a phoenix. Global Warming is forever enmeshed in scandal, where the UN and their scientists discarded data and cherry-picked only that which confirmed the theory. Global Warming was likewise proclaimed to be following computer models, which quickly became irrelevant as the melting ice and permafrost outran the models. None of these theories which supposedly “explain” the current weather address the Earth wobble, which is about to announce itself in undeniable terms to the public. Despite the warning given to them last October, 2011 the US government is fast putting drones into operation over their cities. The reason is obvious – they know what is coming. Drones can be used to gather intelligence, learning the routes by which hordes of migrants are heading out of the cities and toward wealthy suburbs or out into the countryside. Drones can also be used to drop tear gas, drop bombs, and direct boots on the ground to block or maim migrants. How drones are used in the future is up to the hands that manage them, in the hands of man, and thus it is difficult to predict the outcome. It is hard to imagine drones being used as a peaceful assist to citizen survival. Would the drones track ahead of a group of migrants, looking for broken bridges or gangs laying in wait in the bushes? Or would drones be used to guard the perimeter of a large survival camp, so that woman and children could tend flocks and herds and garden in the fields with safety? There is, of course, this possibility, but the more likely possibility is that wealthy enclaves would be protected in this manner, and drones used to ensure that a slave labor force remain in the fields and not manage to escape. We have predicted that leading into and after the Pole Shift that the grid will be down, communications relying upon satellites nil and those relying upon towers and land lines devastated. Roads, landing strips, and bridges will be broken and unusable. The ambitions of some in the US military to create personal fiefdoms for themselves, or in combination with some wealthy enclaves to live as kings in the Aftertime, would of course be greatly enhanced by drones. This fact is not lost on them. But a drone is merely a mechanical device, dependent upon electronics and communications from a human handler. Oh, so very easy for benign aliens to scuttle. On April 24, a camera on NASA's Solar and Heliospheric Observatory seems to have captured the image of something very large and artificially constructed hovering perilously close to our solar neighbor. "The streaks in question are consistent with energetic particle (proton) impacts on the CCD, something which is apparent in just about every image," Nathan Rich, of the NRL's solar physics branch, told the website. "These artifacts do not persist from image to image," Rich added, which suggests the cosmic streaks can explain what UFO proponents are hoping turns out to be an extraterrestrial craft. Is there a connection between the article in HuffPro and the Daily Mail and the Puppet Master’s press to get Nancy into the media? There is indeed a direct connection. We have frequently alluded to the Puppet Master’s desire to see Nancy and ZetaTalk in the media, because we have refused to give him answers to some of his burning questions until he does so. Until the 7 of 10 plate movements began playing out in an undeniable fashion, proving once again the accuracy of our predictions, he had mixed feelings about a media press. He also felt that he could manipulate ourselves and Nancy into giving him his answers, but we play this game of chess better than he. Thus, pounding his fist into his desk in frustration, he has reluctantly proceeded to do as we demanded. We have often mentioned that the Puppet Master’s job – being the trustee over the very large Rothchild family trust – is to husband the assets and increase them. This is of course not the Rothchild family known to the public, as the Puppet Master is off the books and cannot be located. His wealth is shielded behind front companies and fronting individuals, hiding the true ownership. The wealth of the publically known Rothchild’s is mere pocket change, an allowance to those born of a female lineage. The trust requires a male lineage. Nancy and the Puppet Master know each other well, and she can confirm he is not the hand behind wars or mistreatment of humanity. These are the actions of lesser players, who have their independence and can and do chose their own path. We have often described the Puppet Master’s role as attempting to “herd cats”, meaning he does not have a command and control position but must induce via bribes or subtle threats – “this is what I can do for you and this what I can do against you, or how about this arrangement” - and by this he manipulates the world so that his asset base increases and his assets are protected. What he wants as the world transforms going into and after the Pole Shift is to have strong survival groups, as he knows he can negotiate trade with them and end up on top of the pile, once again. In our opinion, his expectations are accurate. This is an extremely savy man. Thus we have a mutual goal in strong survival groups, and a mutual enemy in the cover-up. In stepping forward to arrange for Nancy and ZetaTalk to have more media attention the Puppet Master found this not as easy as he anticipated. The media had been told for years that any discussion of a planet next to the Sun, in the inner solar system, was verboten, forbidden. Weatherman were told not to mention broken records continuously, although on occasion this would be allowed or the public would be suspicious. ZetaTalk or Nancy Lieder were not allowed as subjects, except for ridicule as senior NASA spokespersons sent Nancy’s way. The Earth wobble was also strictly forbidden as a topic, despite the Sun and Moon being out of position regularly. Thus, when instructed to loosen up and start talking about these forbidden topics, the talking heads were almost catatonic, unable to move. Thus the Puppet Master’s hand was indeed behind the recent article about the SOHO images, quoting the inadequate explanation from NASA. Typing SOHO into a search engine will indeed bring up the Pole Shift ning and the ZetaTalk explanations, arriving at the CheckMark Moon Swirl description, but more is needed. The cover-up threatens so many lesser players, who can balk and continue to threaten and plea with the media, that steady erosion of the cover-up support in the media will need to occur. Meanwhile, the Council of Worlds has their own cards to play. The time is nigh for the second punch to occur, to show the public that the cover-ups claims that Global Warming and solar flares are responsible for the current Earth changes are a lie. Look for a more severe wobble, which could only be caused by the presence of another large gravitational and magnetic body between the Earth and Sun, to occur. Would zetas like to comment on exactly what is happening to Hokkaido in Japan? The landslides look quite similar to what happened in Norway? A stretch zone? [and from another] Approximately 60,000 Cubic Meter Earth and Sand! [Apr 25] http://talk-hokkaido.blogspot.co.nz/2012/04/approximately-60000cubic-meter-earth.html The landslide had taken away the earth and sand of totally about 60,000 cubic meters including the roadside. The depth of the canyon the landslide of 100 meters made was 25 meter in depth and 50 meters in width. Would the Zetas care to comment on the political calculations by the Clintons? Recently, Bill has been more publicly supportive of Obama, and they even met for an event together a few days ago. The Zetas have said in the past how angry Bill was over Hilary's loss in 2008. With confirmation of the 7/10 events unfolding as described by the Zetas, which the elites certainly have, I would think that the Clintons are not interested in waiting until 2016 to try to get the presidency. Also, if the Clintons have thrown in with the Bush family, which I believe would use Romney as a puppet were he to win, then somehow supplanting Obama with Hilary would guarantee as much comfort as possible for these elites, and probable controlling interests in the Aftertime. Obama just went to Afghanistan, secretly, but the itinerary was leaked, and a suicide bomber did explode apparently after Obama left. [and from another] http://www.miamiherald.com/2012/04/26/2769422/clinton-branson-my-last-chance.html Secretary of State Hillary Rodham Clinton's childhood aspiration of becoming an astronaut was dashed by NASA, but she may not be giving up on the dream of reaching the heavens. Clinton welcomed the British billionaire Richard Branson to a State Department conference on global investment by saying she was "excited he's here because many, many, many years ago, I wanted to be an astronaut, and I think he may be my last chance to live out that particular dream." She often tells the story about how NASA rejected her inquiry on joining the space program in the early 1960s because she was a girl. Branson's Virgin Galactic Venture will send paying tourists into space. [and from another] http://www.reuters.com/article/2012/04/30/us-usa-campaign-obama-idUSBRE83T00E20120430 Clinton had not appeared with Obama this election cycle. But last week the Obama campaign released a video of Clinton praising Obama for approving the commando raid that killed Osama bin Laden in Pakistan last May. As Secretary of State, Hillary is enmeshed in the worry that heads of state have about the current Earth changes and in particular about the predicted cataclysmic changes to come. They want her to be the courier for any new, to negotiate arrangements between countries, and to arrange for more support from the US. They beg for personal accommodations, wanting Obama to protect the elite, who like the Queen would be deserting their public. None of this is her job, nor does she have the ability to make these arrangements. Weary of the constant haranguing and demands, she has looked haggard and indicated she will resign her position after this year. Meanwhile, after being highly resentful of Hillary’s loss to Obama in 2008, Bill seems to have come around to become an eager campaign supporter for Obama’s re-election in 2012. In the four years since 2008, the Clinton’s have migrated from resenting Obama to a different posture. It is hard to imagine the haggard Hillary of today wanting to be president, and likewise it is hard to reconcile the eager Bill of today with the pouting Bill of 2008. What has happened, of course, is the plate movements predicted by ourselves, the 7 of 10 scenarios. Suddenly, the world of politics as usual is put behind the very real necessity of arranging for one’s future life in the Aftertime. What this means for the Clinton’s, who have never lacked for a sense of self-preservation or in some cases frank greed, is a strong bond with Obama. Hillary’s admiration for Richard Branson’s Virgin space junkets is more than the remnant of a childhood ambition to be an astronaut. It is a desire to court an association with those wealthy and powerful individuals she sees actively planning for survival. She will try to move from hobnobbing with heads of state to hobnobbing with the very wealthy and powerful, all carefully cloaked with excuses about the economy. Watching the elite can give many clues to their thinking, revealing what they know about the approach of Planet X. Meanwhile, the common man hears nothing but lies. It has been reported from Tel Aviv and Sharon, Israel that a "strong chemical smell" has been infusing the air, alarming locals greatly. It would appear that officials are at a loss to explain this pungent "gas" odor. They suggest drilling operations as a cause but admit "The city administration could not identify the source". There is talk of "reported low concentrations of gas in the air" and yet they do not name this mystery gas. Reportedly, Environmental Protection Minister Gilad Erdan has ordered a "a criminal investigation into discovering who created the "nuisance odor" that pervaded Israel’s central coast on Thursday. " This may be unrelated, but I wonder whether the Z's would speak to the possibility that Planet X and 7 of 10 plate movement are the guilty party they should be looking to? [and from another] http://www.israelnationalnews.com/News/News.aspx/155421#.T6LGWtmJUW- The officials reported low concentrations of gas in the air, which they say do not pose a danger to public health. However, a local environmental consultant told Channel 10 that concentrations producing a pungent scent were not healthy. However, the IDF Home Front Command identified the source of the smell as drilling off the coast of Ashdod. Ramat Hasharon Mayor Itzik Rochberger complained that while the HFC told him the source of the smell, officials from the Environment Ministry were still in the dark. [and from another] http://www.israelnationalnews.com/News/News.aspx/155433#.T6LGz9mJUW- The pungent odor was described by the numerous people who complained to municipal officials, police, and media as being chlorine, bromide, insecticide, and similar “chemical” smells. The IDF Home Front Command said late Thursday morning that it believed the smell emanated from gas drilling operations off the coast of Ashdod, but environmental experts note that natural gas is odorless until butyl mercaptan or thiophane is added as a safety precaution. One can see what happens as the Arabian Plate, the boot, rotates in response to the Atlantic widening and the African Plate rolling its top eastward while dropping. The plate border that runs up through the Dead Sea pulls apart. This is the classic stretch zone situation when rock layers are pulled apart and release methane gas from organic material long trapped between rock layers. Phew. Natural gas, as is known, is odorless, so this lets any drilling operations off the coast off the hook. As during the famous Earth Fart day in 2007, methane stinks, makes people ill, kills birds, and causes panic as a gas or chemical leak is suspected. 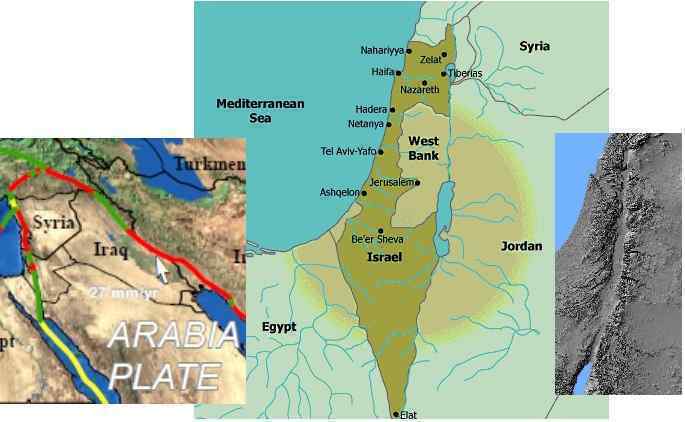 Israel is loath to admit to its people that plate movement is occurring, so confabulates.